The Importance attributed to the Govardhan Pooja is for people to cast off blind faith and worship only that which is visible and practical. Lord Krishna taught the people of Vrindavan to cultivate the practice of worshipping Mother Nature which has always been fundamental and integral to Hinduism. The main purpose behind the mountain worship has always been the conservation and protection of the vulnerable and precious natural resources. According to the scriptural text 'Vishnu Puraan', the people of Gokul used to worship and prepare a sacrifice to appease Lord Indra, the king of the Devas. 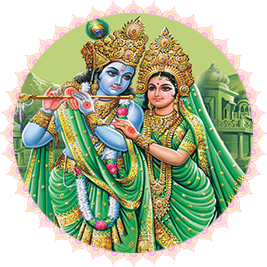 Lord Krishna in his supreme wisdom decided to take it upon himself to lead the people on the right path and advised everyone not to follow the rituals blindly. Lord Krishna convinced the people of Gokul that rituals propitiating Lord Indra for rain are unfounded and instead led them to believe in the sanctity of worshipping the Govardhan Mountain. Hence people started offering Poojas to the mountain in a gesture of respect and devotion. This aroused the anger of Lord Indra who vents his fury upon the people of Brindavan and set off a lightning storm and torrential downpour upon the village for days. The villagers flocked to Lord Krishna who, after performing Pooja and offering prayers to Govardhan, lifted the mountain on the little finger of his right hand so that everyone could take shelter under the hill. He lifted the hill for seven days and seven nights and came to be known as Giridhari after this incident. Indra, upon witnessing the miraculous power of the Lord, bowed to Lord Krishna’s superiority. On this day, hillocks of cow-dung symbolizing the Govardhan hill are decorated with flowers and garlands. Devotees perceive these as symbolizing Mount Govardhan and offer worship with great piety and fervor. ask for forgiveness from God and express devotion towards the Supreme Power. People celebrate the festival with small oil lamps and put rangoli (decorative art) on the ground with colored rice, colored sand, and flower petals. Many distinct food items (Chhapan Bhog) are offered to deities during this Festival and then distributed as Prasad to devotees. Govardhan Pooja and other ceremonies are the best time to impart religious and cultural values to children. This festival teaches about the connection between humans and nature. This imparts the feeling of conservation among the people. Lord Krishna becomes an amulet to protect the family against all challenges and bestows enormous blessings.